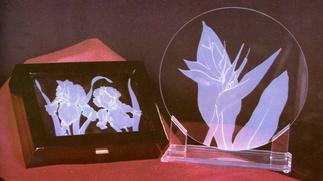 All Gift/Jewelry Boxes are Hand Carved Beveled Glass; Approx. 3 1/2 L x 3 1/2 W x 2 1/4 H. Inside base is mirrored glass. Sides are clear glass on all sides with braided silver-plated brass trim accent. 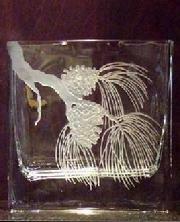 Top is hinged with a unique hand carved design on beveled glass. Boxes rest on attractive rounded brass feet. The "Pamelyn" Votive $22.00 ea. The "Betty" Votive $22.00 ea. The "Florence" Votive $22.00 ea. The "Shauna" Votive $22.00 ea. The "Shannon" Votive $22.00 ea. The "Naniva" Votive $22.00 ea. The "Scallop" Shell Votive $22.00 ea. The "Sand Dollar" Votive $22.00 ea. The "Sunburst" Shell Votive $22.00 ea. The "Spiral" Shell Votive $22.00 ea. The "Starfish" Votive $22.00 ea. The "Conch" Votive $22.00 ea. All designs and images on this site are the exclusive property of Debra Felberg Oxley and are copyrighted. Any use or reproduction without the express written permission of the artist and/or fully executed license agreement is prohibited.